If you, like me, adore sweet potatoes, try this alternative. Just for a change. There's always time to go back to the traditional gnocchi. The result is a brighter and slightly sweet version, which - I have to admit - would fight against meat sauce, but which, on the other hand, doesn't ask anything more than a simple butter and sage sauce. What's better than this? I'd like to take this opportunity to share a couple of tricks on the subject Perfect Gnocchi, which I've learned throughout the years from my pot friends, both the virtual ones and the real ones. 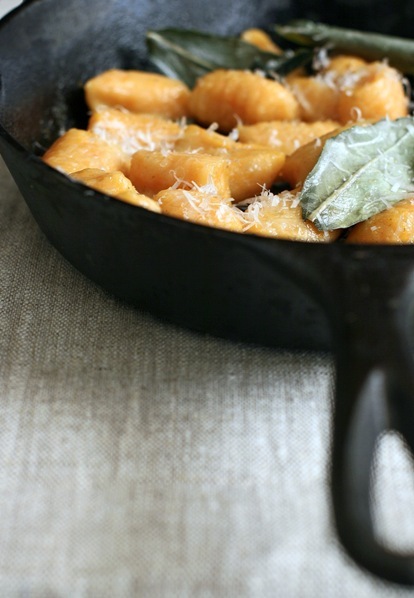 If you've fought against gnocchi for years, like me, desperately trying to get something more than little yellow stones vaguely tasting like potatoes, you could find these three little tricks very useful. Do NOT put salt in the dough. Salt makes potatoes watery, and, again, it forces to use more flour. I swear, since I've discovered the aforementioned Three Golden Rules of Gnocchi, my life has changed. For the better. Even if at the end of this all, there's always a famous Aunt Andreina, who makes the best gnocchi in the world and who doesn't give a damn of these rules. But that's another story. Wrap potatoes in some foil, place them on a baking sheet and bake at 450 for about 45 minutes, until they are soft to the touch (one more advice, pay attention not to cook them too long, they shouldn't come apart). Peel potatoes and smash them, transfering them in a large bowl. Let them cool completely before starting to work the dough. After they've cooled down, season potatoes with salt, pepper, nutmeg and a couple of tablespoons of freshly grated parmigiano cheese (yes, I know that just two lines above I was telling you NOT to use any salt in the dough, but I think that in this version with sweet potatoes it's better to use a pinch of salt, especially if the sauce is very simple, like in this case). Add flour gradually and work the dough until it comes together, it's smooth and slightly wet. At this point, it's better to do a test, cutting out a couple of gnocchi and cooking them in a pot full of simmering water, to see if the dough holds. If not, add more flour and keep working the dough until you get the desired consistency. Lightly dust the work surface with flour, take a piece of dough and rolling it with your hands, form a 1/2-inch-thick rope. Cut gnocchi out of it and make ridges on one side of them, rolling them down fork tines one by one and lightly pressing with your fingers (for this job you could also resort to the proper tool, the famous yet useless Gnocchi-Scorer, which I bought several years ago, struck by an uncontrollable drive). Keep going like this until you finish the dough. Cook gnocchi in boiling salted water and drain them as soon as they come floating to the surface. Dress them with melted butter, cooked with few fresh sage leaves, and sprinkle them with freshly grated parmigiano cheese. haven't tried your gnocchi yet, but i like working with sweet potatoes and yams. actually i was looking for a simple marinara sauce when i "stumbled" upon this.